Vineyards that are established for producing high quality wines are actively managed by the Viticulturist and typically would have either 2 or 3 sets of foliage wires.These wires are in place to help keep the canopy of foliage under control, and at the same time allow a large surface area of leaves to get exposure to the sun. 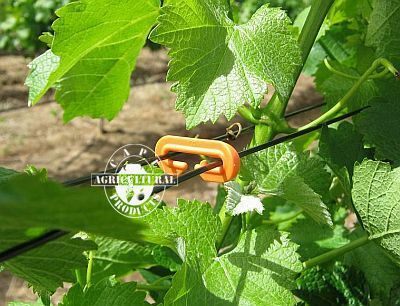 The foliage wires are normally secured at each pole in the vineyard row by using Trelliclips®. However, in order to keep it as upright as possible, the canopy needs to be managed between the poles as well. This is where the use of foliage wire clips is recommended. Foliage wire clips are available in a variety of sizes and materials, ranging from compressed paper to steel. The C-Clip foliage wire clips is made from high quality materials and is very easy to apply to the foliage wires. It has 2 small "studs" that hold one side of the clip in place on one of the wires. The bright orange colour makes it easy to see the clips on the wires when applying or removing them. C-Clips can be used on traditional steel wires, as well as on Deltex® polyester wire, in fact C-Clips are ideal for use with Deltex. A new addition to our range of foliage wire clips, the Clip 44 is imported from Spain and is very well priced. 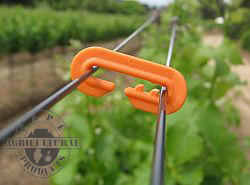 Made from top quality raw materials the clip will last more than 2 harvests, if recovered from the vineyard. The gap in the clip is 44mm, wider than the 25mm of the C-Clip above, but still has a high resistance to the lateral forces exerted by the foliage wires. The blue colour makes identification very easy. The clip 44 also has 1 "stud" to keep it from falling off the wires in windy conditions, as seen here. Clip 44 can be used on Deltex® polyester wire. Vegeclips are made from biodegradable resources without any added plastic. Very strong when attached initially, they break down in winter during the rainy season and fall to the ground where the decomposing process continues. 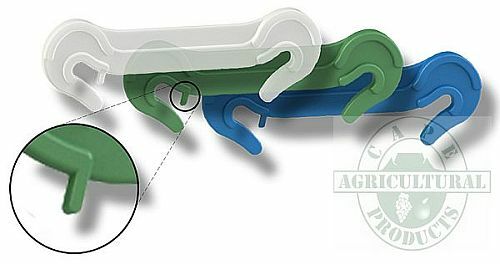 As with C-Clips, the vegeclips are quick to apply and they do not have to be removed at the end of the season. Vegeclips are eco-friendly, being manufactured from 100% raw vegetable material. 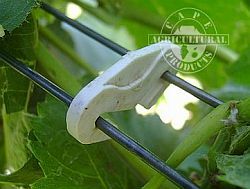 Vegeclips are "soft" on your foliage wires and you can avoid rust which may occur after friction between steel clips/staples and the wire. e-Clip foliage wire clips are made from 2mm galvanised steel wire and are strong enough to hold your steel foliage wires in place. 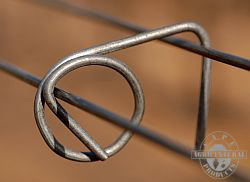 The wire is bent in a manner that ensures the clip will not come loose and fall off the wire it is attached to. Attach the circular "locking" side to one wire and hook the other side over the other wire.